This oracular system of forty-five beautifully illustrated cards and its accompanying book of affirmations and meditations presents the wisdom of the universe as it has been revealed through the Sisterhood of the Shields. To heal the earth, we must first heal ourselves. "The Power Deck," writes Lynn Andrews, "helps you find the primal source of your pain, or limitation, so that it can be healed. Pick a card each morning and place it on your altar of empowerment. When you look at it, you will stop for a moment to move into that silent place within you, that place where truth is born. Each card promotes beauty, health, strength and wisdom in your life." THE POWER DECK includes a beautifully-packaged book in a slipcase and a deck of cards. 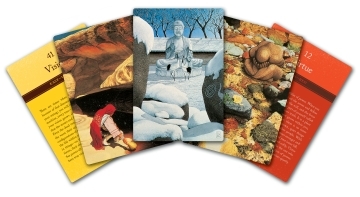 The book builds self-esteem by displaying positive and negative aspects of the user's personality - the pieces of the personal puzzle that are present and those that are missing - and each card features imagery reflecting Mother Earth and Father Sky, along with an affirmation that conveys the lesson of power and facilitates meditation.